When I first went CLEAN I was doing the Wheat Belly Diet. Dr. Davis, of Wheat Belly fame, uses lots of peanuts in his recipes. So I scoured Winnipeg for peanut flour. And when I didn't find any, I scoured the internet and ordered some on-line. But then I went PALEO.........and then I went on the Candida diet.........and then I found out my daughter had peanuts on her "no go" list. So the peanut flour just sat there in the freezer. But I've come full circle. I'm trying not to be scared of food. I don't think a half cup of peanut flour is going to make me so moldy, acidic (etc, etc, etc insert scary word) that I won't survive. I'm trying to be more balanced with my eating. Because the stress you can cause yourself from being insanely strict with your diet can wipe out all the awesome benefits of eating clean. So I pulled out the peanut flour and decided to make some peanut cookies. 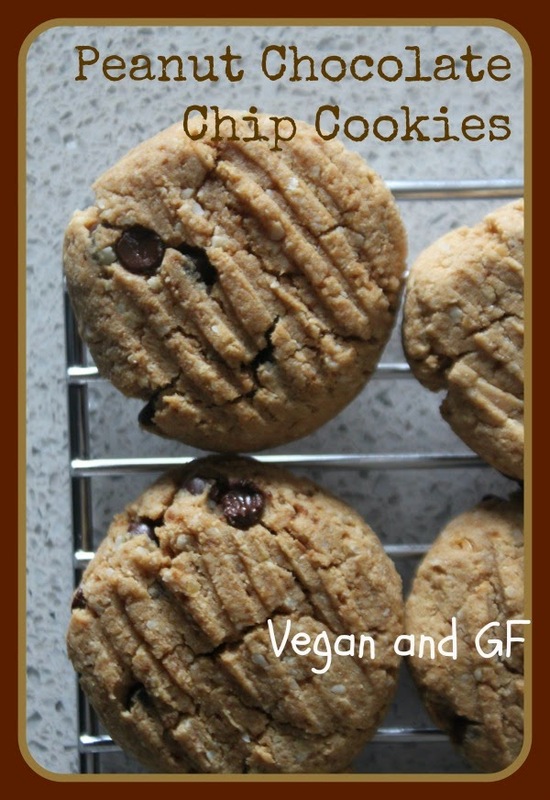 If you don't have peanut flour, I don't see why these wouldn't work with almond flour or almond meal. And damn I am enjoying them. They aren't fully PALEO, fully Candida diet friendly, or fully grain-free. But they are full of great "clean" ingredients and they are FULLY VEGAN. I'm choosing to pick my battles. Gotta run. I feel like eating a cookie! Mix together first 3 ingredients. Let stand for a couple of minutes. In a second bowl, whip together oil/butter and sugar. Mix until fully combined and slightly fluffy. Add applesauce and vanilla. Mix together two separate bowls of wet ingredients. Add dry ingredients and chocolate chips. Stir until just combined. Scoop out a heaping Tbsp at a time. Form into balls and then flatten out slightly with the back of a fork. Remove from oven and let cool before eating. I dare ya!